Today’s the last day for the CloudMade London team. We’re not powering down any servers. It’s business as usual for the rest of CloudMade, but for me, Andy, Matt, Shaun and Emma it’s time to finish packing up junk and selecting office furniture to purloin. It’s been an pretty amazing year. Our team here in London was working with the OpenStreetMap community to further the goals of the project, and I hope we did a good job of this, but I can’t help feeling regret at not having done more, or certainly at not being able to continue the work. It’s been hectic. Time was gobbled up on the various OSM communication channels and on CloudMade support emails. What was left was generally spread too thinly between many projects and ideas. I’ve been in the eye of the OpenStreetMap storm, watching powerless as the debris flies past. I’m sure future jobs won’t ever be quite the same (and not nearly as much fun), but right now I still have a head full of project ideas and a busy inbox, so I need to learn the lessons and get better at juggling these things. Last week I saw some great talks at the Open Source Show and Tell, and some of them really related well to OpenStreetMap and to what might have come next for our team. 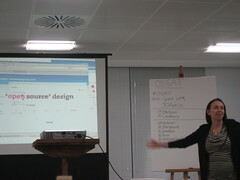 Leisa Reichelt talked about the Drupal 7 User Experience Project. A group of paid people worked on a major UX overhaul for the next version of Drupal. She described the type of usability studies they did, and some of the processes they had to go through to introduce these ideas and have them adopted by the drupal developer community. She said they used video a lot (see YouTube group), not just because it gets across usability ideas well, but just as a more engaging way of getting their message to the community. She stressed the need for feedback early on, and throughout the process. Now OpenStreetMap is just at the beginning of this process, with a few people starting to mention UX as the next big priority (Not just front page flower-arranging. We need to look at the whole user experience) As an Open Source project, we’re pretty small fry compared with Drupal. Certainly we can try to do a similar thing, but it’s shame there’s no longer a paid team of people who could dedicate themselves to this. 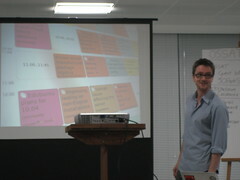 Iain Farrell talked about Canonical and their work with the ubuntu community. He talked about the big community conferences they hold every 6 months. Naturally this made me think of OpenStreetMap’s State Of The Map conference, but actually these are all about getting ubuntu developers together to brain-storm and design the next releases of the software. Clearly this is another highly “mature” Open Source community, and the conferences fit into a very specific point in their carefully controlled release cycles. What’s the closest thing OpenStreetMap has to this? Probably our London developer meet-ups and “hack weekends”. That’s another thing we’re going to struggle to do now, if only in terms of having a venue. Things like release cycles and UX reviews all require a level of coordination beyond the basic mish-mash of individual developers scratching their own itches. As OpenStreetMap continues to grow, we’ll need more coordination. I’m sure Foundation Working Groups will be part of the solution, but these are made up of volunteers too. I’m sure we’ll make it work one way or another, but I’m sorry our CloudMade team didn’t get to see things through to the next level in 2010.